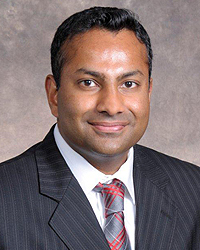 Prasanth Lingam, MD, specializes in cardiology with an emphasis on interventional Cardiology procedures. He received his undergraduate degree from the University of Dayton and his medical degree from the University of Cincinnati College of Medicine. He completed his internship and residency at Loyola University in Chicago and a fellowship in structural heart disease at Henry Ford Hospital in Detroit. He is board certified in Internal Medicine, Cardiovascular Disease, Interventional Cardiology and Nuclear Cardiology. In his spare time, Dr. Lingam enjoys sports, outdoor activities and spending time with his wife and young son. Dr. Lingam offers the Watchman™ procedure that reduces the risk of stroke in patients with non-valvular atrial fibrillation. This procedure eliminates the need for long-term use of anticoagulants (blood thinners).